Ready for a fun giveaway on this Monday morning? I was so excited to find this etsy seller and artist. I have a thing for fancy shmancy lettering. It's something I have never seemed to nail down. But Kate is a genius! a $25 voucher to use in her shop! 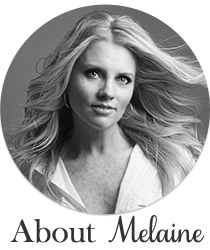 She will even create custom sayings and colors just for you! I'm even beginning to see a bit of Christmas making it's way in her shop! You can also follow Kate on Pinterest, and she has a great tumblr right here. Leave me a comment letting me know your favorite saying, famous or not. This giveaway is open to international readers as well, just be sure and leave me your email address if you don't have a blog. 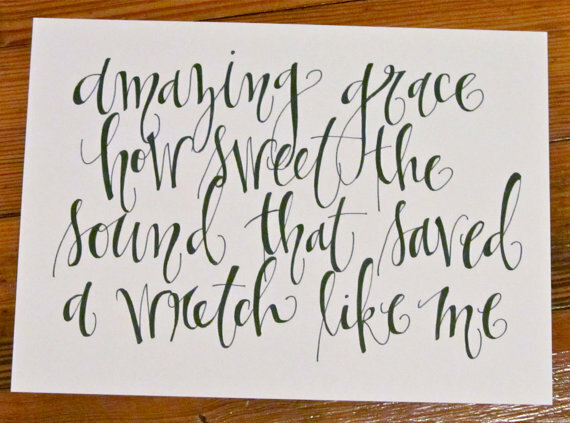 I would love one with a verse or old hymn, like Amazing Grace-so pretty! Love the 'Come Thou Fount' print! I love the oh holy night one! oh holy night is cool! Just because something isn't happening for you right now, doesn't mean that it will never happen. I can do all things through Christ who gives me strength . . . what beautiful lettering! I don't know that I have a favorite saying, but OH. MY. GOSH. Her stuff is amazing! 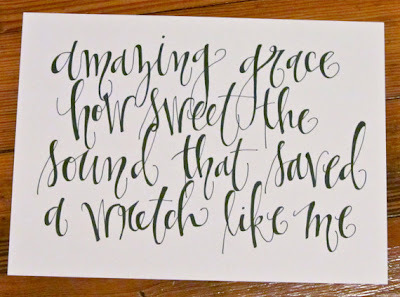 Amazing Grace...it makes me cry every single time I hear it (it reminds me of my late grandmother). Thanks for a great giveaway.. So many choices. Thou who art in heaven is one that sends chills down my spine..
Amazing Grace. It reminds me of my late grandmother, and I cry Every single time I hear it. Bloom where you are planted. ....I am working on this one! Oh, Holy Night! Now i will be singing it all day! I would have a hard time choosing! I love beautiful words! For Christmas ... O come let us adore Him. Oh Holy Night! Makes me ready for Christmas again! her work is stunning. i love joy to the world. lovely. These are beautiful! I love the Oh Holy night! I would love to have the verse, "Be Strong and Courageous and Do Not Be AFtraid" for my son! My children's kindergarten teacher always said: you don't have to like everyone, but you do have to be nice to everyone. I have quoted her more times than I can count! "Come Thou Fount of Every Blessing" was my husband's favorite Hymn. oh, i love all of her quotes! i think i especially like her amazing grace quote. "The Lord your God is with you, He is mighty to save. He will quiet you with His love. He will rejoice over you with singing." Beautiful! I would have a custom one made that says "Love is most violent to save." I just love your porch...I went to her etsy shop oh my so many great sayings. I always love "You are my sunshine, my only sunshine". My mom would sing that to me. I love her work! I would really have to think about a quote, but possibly "Oh Holy Night"
My favorite saying would be "Be Nice"
be fun to have it hanging on the wall. Micah 6:8, just lovely for the home. I'm with you - - LOVE pretty fonts, even taught myself how to do calligraphy once :) I like the 'it is well with my soul' but would love any of them the same. I've stalked your blog for ages ;) Thanks for the chance to win! "Whatever is true, just, etc..." or "O Holy Night" ...love them all. 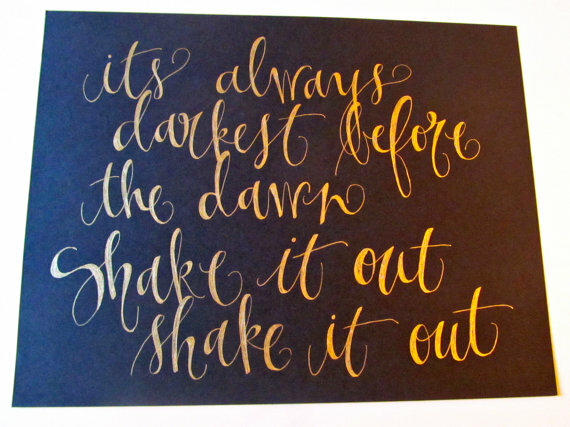 Beautiful script! it would likely be a Bible verse,but I would have to think on it for a while! 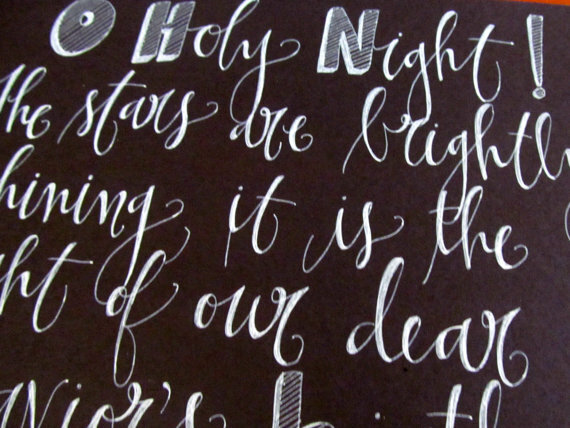 Love the Oh Holy Night as well as the Micah 6:8. Beautiful work! I love the quote, "Wherever you go, no matter what the weather, always bring your own sunshine." I love them all : o ) Beautiful! Oh Holy Night is probably my favorite! 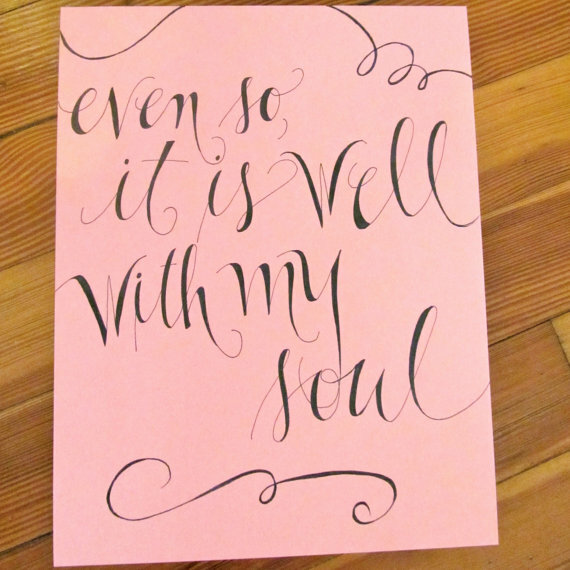 it is well with my soul is something i repeat to myself every single day. it helps me get through life in a more calm an peaceful way. what beautiful print. My favorite saying is probably "All good things are wild and free" or "the stars we are given, the constellations we make"
what a fun giveaway! I adore jane austen quotes, as well as scripture quotes. thanks for the chance. I love,“There are far, far better things ahead than any we leave behind.” by C.S. Lewis. I'd probably pick "Forever, for always, no matter what" bc we're using that in some of our paper goods for our wedding! They're beautiful! Oh holy night would be so pretty to add to my Christmas decor. Artistic and well made printed. Have you used paint or oil pastel? I love the "It is well with my soul" and the anxious for nothing as well as the Christmas one. Thanks for sharing the site! 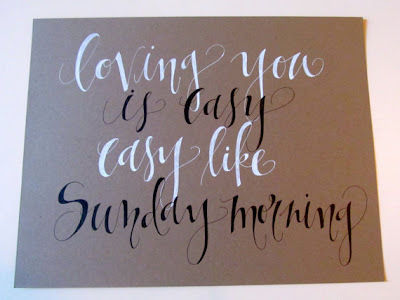 Love these beautiful signs! My favorite Saying is ...the most important things in life ...aren't things. far better things - a quote by C.S. Lewis. But it was difficult to choose. So many lovely pieces. Thanks for pointing her our to us. I love her style! Reminds me of the awesome chalkboard work I've seen floating around the web. I'm loving this quote right now: "Sometimes," said pooh, "The smallest things take up the most room in your heart."